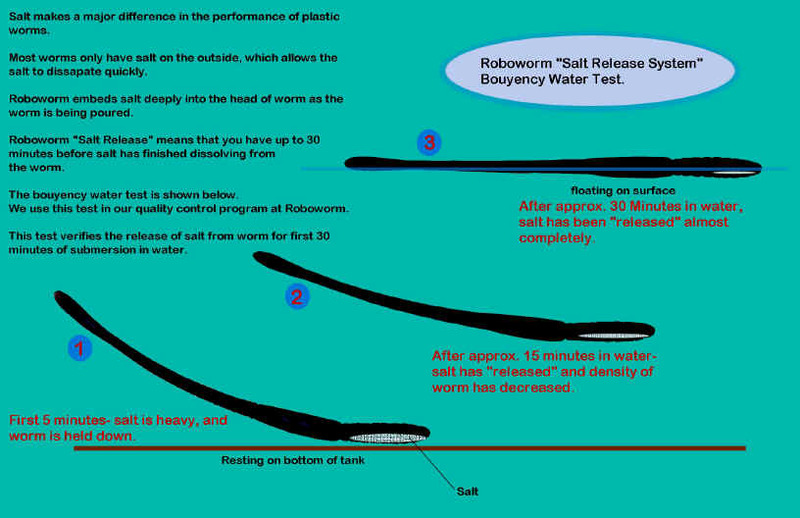 Roboworm's exclusive "Salt Release System" gives you the edge very time out on the water. Research has shown that salt is a powerful attractant while bass fishing. Roboworm has been able to pour a soft plastic worm that actually releases salt during your entire cast. Most worms have salt either trapped inside, or just coating the plastic. Roboworm infuses the head of the worm with salt allowing it to slowly leech out during your cast. When a fish strikes, a burst of salt is released, helping the fish to hold onto the bait longer, enabling you to detect the bite and set the hook. We continually improve upon this process and Roboworm is getting more and more salt into their baits then ever before!